contemporary | "A Stitch in Time"
Wow was that improper sentence structure or what?? 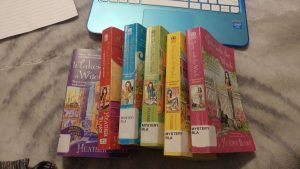 But I couldn’t resist sitting down, rereading and then reading all that are currently available in Heather Blake’s Wishcraft Mystery series. My Cousin Veronika totally got me hooked on these before I had left for Minnesota. In fact, I read her copy of the first book in the series and loved it enough to purchase the second (and apparently NEVER go back and get the first book, unless it is hiding in some corner of some random Rubbermaid tub I have yet to properly sort… could happen!). This time round I requested #1 and 3-6 from my local library (I so love my library card!) and got to work reading them all. Instead of reviewing each book individually I think I will just give my overall opinion. THOUGH if you want to read a previous review for the second book (A Witch Before Dying) feel free to check it out A Witch Before Dying. 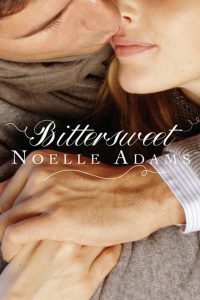 Heather Blake has a real gift for creating a world that you cannot help but enjoy and immerse yourself into. 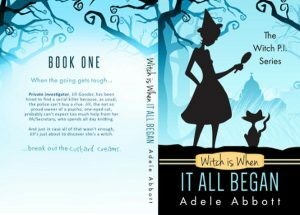 The entire series begins with a set of sisters… Darcy and Harper who are unaware that they come from a line of witches who can grant wishes. Their mother passed away when Harper was born and their father recently died which has left the sisters at loose ends. The Enchanted Village is all things enchanting with a mix of witches and mortals and a few in between. What I love about this series is that the characters are so well developed, the entire village is full of interconnected souls that you just want to know more about. From Aunt Ve, to young Mimi (the daughter of Darcy’s love interest), to a rather unique parrot named Archie who is WAY more than he seems. The mysteries are a cross of magic and mortal and the who done its are interesting unto themselves. I did find that the main “nemesis” of Darcy’s was instantly on my do not like list (as I think the author intended). We shall see if there is a redemption there, BUT I don’t want to give away anything or lead you down a path. Another wonderful aspect in this series is that there are various extended mysteries that run through multiple (if not all of the current) books. In retrospect I now see how if I was REALLY intending to figure it out there are clues here and there but am actually rather thankful that I was not able or focused on sussing them out. The reveals to these intriguing mysteries were as wonderful as the journey to the solutions were. I think if you enjoy some magic with your mystery and a little love to boot this could be the series for you! I know I am looking forward to book #7!